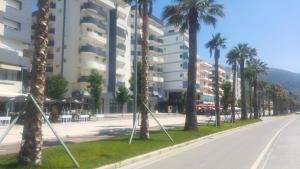 A-HOTEL.com - Luxury and cheap accommodation in Vlorë, Albania. Prices and hotel, apartment booking in Vlorë and surrounding. This indicative offer was derived from the most recently booked accommodation in Vlorë and sort by the price, from cheapest Vlorë accommodation to the most expensive hotels. To select accommodation by your preferences we recommend to choose from 409 accommodation offers in Vlorë in total. By entering the dates of your overnight stay in Vlorë and using the filter tools you can sort the best possible accommodation for you. The entered dates of your stay are crucial for the most accurate offer as it derives all the online information on pricing and availability of Vlorë accommodation. Then you can book the selected Vlorë lodging (hotels, apartments etc.) immediately. Boasting an on-site bar and restaurant with a terrace, Villamaria Hotel is located in Vlorë and features a beachfront location. Port of Vlora is 10km away. Featuring free WiFi and a children's playground, Hotel Royal offers accommodation 9.5 km from Vlorë centre. Featuring a private beach area and an à-la-carte restaurant, Hotel Garden is located in Radhimë. It offers air-conditioned suites with a balcony and sea views. Hotel Divers in Vlorë features barbecue facilities and a garden. Featuring a 24-hour front desk, this property also provides guests with a restaurant. Situated 5 km from Kuzum Baba and 5 km from Independence Square, Residenca Juli features accommodation in Vlorë. Free WiFi is offered. Set in Vlorë, 3.3 km from Kuzum Baba, Promenade Beach Studio Apartment provides a living room with a flat-screen TV. Set just 50 metres from the sea in Vlorë, Oronato Hotel features an on-site bar with a large garden with views of the sea. Free WiFi is provided throughout the property and free private parking is available on site. Located in Vlorë, Oslo Apartments - Albania offers accommodation within 4 km of Kuzum Baba. Complimentary WiFi is featured. Featuring barbecue facilities as well as a garden, Agetina's Apartaments is located in Vlorë, within 2.5 km of Independence Square and 2. Located right on the seafront and 5 km from Kuzum Baba in Vlorë, Le Palazzine Hotel welcomes guests with a restaurant and bar. It features free WiFi throughout the property. Located 3.8 km from Kuzum Baba, Berti Apartment offers free WiFi. Located in Vlorë, Hotel Liro offers a private beach area with free-to-use sun loungers and parasols. The on-site bar and restaurant offers a spacious terrace where guests can enjoy the Mediterranean dishes it serves. Situated in Vlorë, 10 km from Kuzum Baba, Vila Rahmi & Veli Dervishaj features accommodation with free WiFi. Some units also have a kitchen equipped with a microwave, a toaster, and a fridge. Situated in Vlorë within 1.4 km of Independence Square, Villa Isabella provides accommodation with seating area and a kitchen. Situated in Vlorë, 4 km from Kuzum Baba, Ruby Palace has a garden. With a terrace, the 4-star hotel has air-conditioned rooms with free WiFi. Hotel Vlora International is set only 10 metres from Vlora Bay. The property offers comfortable and modern rooms and suites. Located in Vlorë, 2.5 km from Kuzum Baba and 2.